As far as transit services go, subway stations are caught amidst a delicate balancing act. On the one hand, it’s far more important for the MTA’s offerings to ensure that tracks, its signal system and the rolling stock are in top shape than it is to gussy up its subway stations. On the other hand, though, subway station appearance sets a tone for the level of care the authority gives its outward-looking infrastructure. Decrepit stations with rats and garbage indicates a level of inattention to passenger environment. Today, the Straphangers Campaign released their assessment of subway station conditions, and the report attempts to quantify what we see on a daily basis. Their team observed 250 station platform at 120 randomly selected stops. That figure, they say, represents 28 percent of the system’s 909 platforms. During the survey, conducted last year, they found some good, some bad and some ugly. As they highlight it, the good is a bare qualifier. Every station they saw had garbage cans present, and somehow, only one of the 250 suffered from overflowing trash cans. Furthermore, only six percent had visible garbage bags lying about. The bad included rats in 15 out of 139 underground stations — a figure that seemed low to me — missing tile, exposed wiring and cracked floors and staircase. The ugly though was ugly. Nearly 80 percent of stations had substantial peeling paint while 53 percent suffered from water damage. Yet, despite these findings, I am inclined to think that the Straphangers over-rate the state of the stations. It’s the subtle things that matter. Sure, every station may have a trash can or two, but as I’ve noted in the past, at 7th Ave. on the Culver Line for instance, the last garbage can is a few hundred feet from the end of the platform. Thus, garbage piles up far from the trash receptacle. Meanwhile, while recently renovated stations alleviate the underground blight, those that haven’t gone under the knife in decades, if ever, look worse for the wear. In the Bronx along the IRT lines, in Brooklyn both above and below ground, throughout Queens, stations are literally falling apart. Walls are bare, floors are grimy, benches are just flat-out gross. Franklin St. in Tribeca might look great, but the 149th St.-Grand Concourse subway station has needed a substantial amount of work for at least two decades, if not longer. It’s hard to maintain over 468 subway stations, many of which suffer from decades of deferred maintenance. It’s costly and time-consuming to keep up with the seemingly unattainable State of Good Repair, and painting over leaky walls and cracked ceilings is akin to putting make-up on a pig. But between rats and water damager, dark corners and garbage bags, the city’s stations need some help. This report is just another voice calling out for better repairs. The M50 takes home the dubious distinction of being the slowest in the city. If you’re trying to get across town in a hurry, you’re better off walking than taking the M50, according to the Straphangers Campaign. The transit riders advocacy group released its latest Pokey and Schleppy Awards this morning, and Manhattan’s M50 which runs crosstown on 49th and 50th Sts. was found to be the slowest with speeds of just 3.5 mph at noon on a weekday. “You can push a lawnmower faster crosstown than it takes the M50 to go from 1st to 12th Avenue,” Straphangers attorney Gene Russianoff said at a press conference this morning. It seems as well that riders are aware of the M50’s slow speeds. In 2010, the bus ranked 151st in ridership out of 191 local routes. Only 3905 riders per weekday board the slow-moving crosstown route. Anyone else heading east to west could hop the E or M trains via the 53rd St. tunnel or simply power themselves with their own two feet. In addition to saluting the M50, the Straphangers also recognized the slowest routes in other boroughs as well. In Brooklyn, the B41 which travels via Flatbush Ave. between Kings Plaza and Downtown Brooklyn took home the prize. I’ve always believed Flatbush ripe for BRT-like improvements. In the Bronx, the Bx19 averaged 5.0 mph while the Q58 into Flushing was Queens’ slowest. The S48 earned recognition for its speeds along Staten Island but at an average of 8.8 mph, that’s one bus route that’s downright speedy. In addition to honoring the city’s slowest buses, the Straphangers doled out the Schleppy award for the least reliable bus. Unfortunately, they couldn’t give the award to the entire bus network. So the M101/102/103 routes that run along Lexington and Third Avenues took home the joint prize. These buses — some of the busiest in the city — suffer from missed schedules and excessive bunching. It wasn’t all bad news for buses though as the Straphangers declared that Select Bus Service was living up to its promises. They fond increases in travel speed of asmuch as 50 percent along both the Bx12 and M15 SBS corridors. It is promising then that two bus routes named least reliable in the city by the Straphangers — the B44 in Brooklyn and the S78 along Hylan Boulevard on Staten Island — will soon see their own Select Bus routes. The polls, unfortunately, are somewhat self-selection as the two groups hosted them on their websites and Facebook pages. The respondents therefore are more attuned to transit issues than a typical subway rider may be. Still, the answers are telling. Riders want someone who has experience running other large and complext transit systems, and they want someone with the political skills to raise support for transit in Washington, Albany and City Hall. Those traits represent the Holy Grail amongst transit advocates, and finding the right person who is both willing to stick around and enjoys support from Albany has been a challenge. For what it’s worth, back in 2007, the Straphangers found that 29 percent of payphones were nonfunctioning. That survey had a margin of error of +/- 4 percent, and while the methodologies have changed, the results have not. The best of the most-used underground stations – with 100% of payphones functioning – is the 33rd Street Station on the 6 train on the Lexington Line. The worst of the most-used stations – with only 29% working phones – is the 77th Street station also on the 6 train on the Lexington Line. The leading reason for phones being rated as non-functioning was no dial tone (33%) followed by: cannot connect to a 1-800 test number (21%); coin falls through (14%); won’t return coin (13%); coin slot blocked (11%); and bad handset (7%). In all, 740 payphones were tested. Of these, our surveyors found that 509 (69%) of these were in functioning order. According to the Straphangers, their results jibe with an independent study conducted by the MTA. That report found 30 percent of payphones with “service affecting troubles,” and the two methodologies were largely in line. An internal MTA study conducted last year, however, found that 92 percent of all payphones and every one of Transit’s 468 were in working order. The Straphangers believe that since the internal examiners did not perform a “coin drop” test, those results are likely inflated. Plus, considering cell phone penetration, it matters less if a payphone at an aboveground station is working. Ultimately, a few forces are at work here. On the one hand, subway payphones are scarce. I’ve seen units removed from West 4th St. and from the Bryant Park stop, to name a few, and those that still exist are barely touched. They’re dirty and largely inconvenient. But in the case of an emergency, the system needs functional communications devices, whether those are payphones or intercoms. From the sound of it, though, one out of three payphones just won’t do the job. I snapped the above photo three years ago yesterday while waiting for a train at 7th Ave. along the Culver Line. Since 2008, the physical situation at that station has not improved. Although crews have been working hard on the Culver Viaduct, just down the line, the popular Park Slope station that serves F and G train riders has been in a state of constant decay, and it is not alone amongst the system’s stations. Earlier this week, Transportation Alternatives and the Straphangers Campaign announced a contest. The winner will receive a free 30-day Unlimited Ride MetroCard. All you have to do is snap photos of the subway and bus system. As the group said, the rules are simple. Anyone can submit up to three photos in each of their two categories: Good Transit Scene or Bad Transit Scene. The categories are, in fact, self explanatory. Good Transit Scenes depict “the life and energy of the subway or bus system. Bad Transit Scenes are akin to the ones above. Those photos are supposed to show “conditions on the subways or buses that need fixing, such as drips or broken lighting.” I can only imagine which category will receive more entries. On its own, this contest is a clever idea to get us to think about our surroundings. We’ll see plenty of photographs of great views, trains passing overhead and Arts for Transit installations. But we’ll also see conditions that make us cringe. We’ll see mold-infested stations with crumbling ceilings, staircases with holes in them and rusted metal. We’ll see water-stained walls without tiles and stations covered in trash. We’ll see a system sagging under its own weight. At the same time though, this contest serves as a reminder that photography in the subway is permitted. The Straphangers had to remind folks of that truth by linking to Section 1050.9(3) of New York City Transit’s Rules of Conduct. Yet, countless people are stopped by cops and MTA employees who believe photography in the subway is not allowed. Finally, the Straphangers do plan to present these photos to the MTA once they are all compiled. The authority is, of course, well aware of the state of its infrastructure, but the Bad Transit Scenes will serve as a stark reminder of the widespread nature of the decay. Maybe if the right person in Albany sees the photos, they’ll be motivated enough to ask the right questions and produce results. I can dream, at least. The subways are getting dirtier, the Straphangers Campaign said today in its annual Shmutz Survey, and the R train is the worst of all. 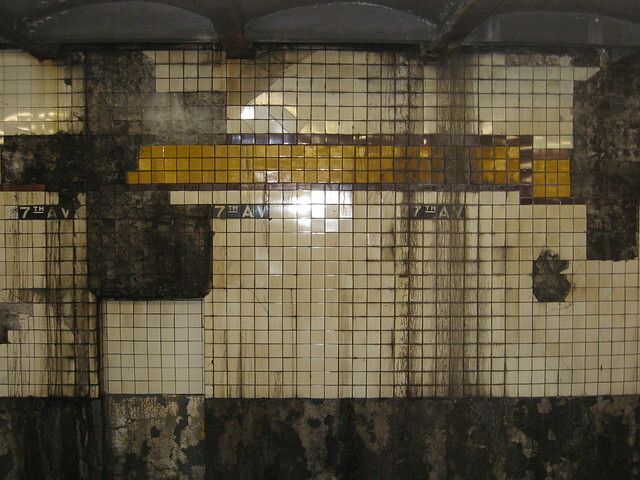 According to the rider advocacy group, the subways are dirty. With only 47 percent of in-service train cars marked as clean, the number of spot-free subway cars is down from 56 percent in the 2008 survey. The R train, with only 27 percent of cars earning a positive cleanliness rating, is the worst while the 7 train, with 68 percent of its cars considered clean, is the best. The MTA disputed these findings while the Straphangers defended them as the two sides who often fight for the same thing find themselves at odds. In discussing the survey results, Straphangers head Gene Russianoff noted how budget cuts impacted the cleaning staff. Car cleaners are done from 1138 with 146 supervisors in 2009 to 1030 with 123 supervisors this year. “Last year, we predicted ‘more cuts to come means more dirt for subway riders.’ And sadly that’s turned out to be true,” he said. The five subway lines that experienced statistically significant deterioration were the 6, B, E, L and R.
The most improved line in our survey was the M, going from 32% clean cars in 2009 to 61% in 2010. It was the one subway line that showed statistically significant improvement. The M was dramatically restructured in June of 2010, combining with the V line and losing 24 stations between downtown Manhattan and southern Brooklyn. The most deteriorated line in our survey was the B, which fell from 61% in 2009 to 37% in 2010. The survey found major disparities in cleanliness among the lines, ranging from a low of 27% clean cars on the R line to a high of 68% on the 7. Kevin Ortiz, an NYC MTA spokesman, said the authority disagreed strongly with the report, “which does not accurately measure NYC Transit’s ability to clean subway cars.” He said the agency is now more flexible in shifting cleaners to trains that need them most, which has led to a “minimal impact” on overall car cleanliness. The Authority has been engaged in aggressive public relations campaign, with placards emblazoned in many subways and buses designed to promote the MTA’s efforts to offer better service. That ad campaign came in the wake of the deepest service cuts and biggest fare hikes in over a generation in the past year. The NYC MTA criticized the Straphangers’ report for rating car cleanliness while trains are in motion and can’t be cleaned, making its ratings more a measure of passenger behavior than authority effectiveness. The NYC MTA rates the cleanliness of its subway cars when trains are stationary. It’s unclear whether the trains are examined before or after a cleaning crew goes through. However, the authority gives itself a grade of 94 percent subway car cleanliness. That would seem to indicate trains are graded once they’ve been cleaned. The MTA and the Straphangers both want the same thing. They want the authority to be in a fiscal position to offer the appropriate service levels to riders, and right now, station maintenance and cleanliness is suffering. Stations are dirty; trains are dirty. It doesn’t really matter how dirty they are. Rather, what matters is how the MTA can solve these problems. Right now, answers are few and far between. My morning commute from Brooklyn to law school always involves the B train, and it more often than not involves some combination of an inaudible public address system and deafening feedback at some too-early hour of the morning. Of course, those problems aren’t solely unique to the B train. In fact, in-car PA systems throughout the subway range from too loud to inaudible, and even the new pre-recorded announcements seem to have volume control issues. But the Straphangers have anointed a champion in the Bad PA System category, and my B train has won. In a study released yesterday and conducted in 2010, the Straphangers Campaign found that 83 percent of “basic subway announcements” and clear and accurate. The 5, 6 and dearly departed W train took home the top honors all with a surprising 100 percent accuracy rate, but along the B, only 55 percent of announcements were clear and accurate. Somehow, I’m not surprised. While I am cynical of my own daily subway line, the Straphangers were pleased with the results. “Transit gets good marks for subway car announcements of basic information,” Cate Contino, the Straphangers Campaign coordinator who oversaw the survey, said. Yet, for all of the success of the announcements, the MTA seems to falter when it comes to those announcements that aren’t made. The Straphangers found that in 60 percent of delays or disruptions, the announcement never came or was “inaudible, garbled or incorrect.” That figure has grown by five percent since 2009. “A failure to make delay announcement means more stress and confusion for riders,” Jason Chin-Fatt, a Straphangers field organizer, said. According to the Straphangers’ findings, in 22 percent of delays, the conductor failed to make an announcement. Another 27 percent featured incorrect announcements including those termed “meaningless” by the campaign. Those included the pre-recorded “we have a red signal ahead of us” and those lacking information or filled with MTA jargon. Being told that “We are being held by the train’s dispatcher; we should be moving shortly” does few people real favors. Impatience grows supreme. The Straphangers say their findings were based on 6000 observations of in-car announcements made by 51 volunteers from January to June of 2010. The MTA doesn’t tally its own figures, but my general feeling is that these results aren’t far from the mark. Ultimately, these announcements return to a theme that I’ve focused on frequently. It’s all about customer service. To make sure the customer is informed, happy and patient, the MTA should be as detailed as possible but should contain key information. We don’t care that there’s a red signal in front of us; we care that the train isn’t moving and want to know when our journey will resume. If, for an example, an F has to run along the D line to Coney Island, we want to know what that means for future stops. By and large, I find announcements much clearer and easier to understand on the new cars. The PA systems are crisper, and the FIND displays, if accurate, offer up a nice complement to the station stops. Still, informing riders that they are delayed when we know that already seems pointless. It’s a balancing act. What the Straphangers Campaign failed to analyze though are the overall quality of the PA systems. On more than one occasion, I’ve sat through ear-splitting feedback on the B train. The high-pitched piercing sound is far more annoying than being told for the umpteenth time there is “train traffic ahead of us.” When that’s fixed, I’ll be happy. For the full table of announcement quality, check out this pdf. Since 1979, the Straphangers Campaign has been the leading voice in the fight for better transit policy in New York City, and while I don’t always agree with their messages and focus, it would be foolish to deny that Gene Russianoff is a highly influential figure in the current field of transit advocates. To honor the work the Straphangers have done over the years and make sure their efforts retain their rightful place in the public history of the city, the New York Public Library has archived the entire Straphangers record. A whopping 58 boxes of material that span 29.5 linear feet are now available at the NYPL for researchers to scour and the public to inspect. The archive, the Campaign said in a statement, includes 31 years of the following: correspondence with public officials, funders and other transit activists; memos; press releases; published “State of the Subways” and other reports; public hearing transcripts; notes; clippings; flyers, posters and banners; electronic records; an audio recording; and photographs. It’s quite the trove of information. “The Straphangers Campaign is thrilled to be part of the historical record and very grateful to the New York Public Library for doing such an excellent job with several decades of records,” Russianoff said in a statement. The records will be housed at the Manuscripts and Archives Division and require an advanced appointment for access. The Straphangers Campaign does not think 2010 was a banner year for public transit in New York City. The rider advocacy group released their annual list of Top Tens today, and while they managed to put together a list of the top ten best stories of the year, their top ten worst are more sobering. The list includes fare hikes, service cuts and ever-increasing budget gaps, and it portends rough seas ahead for the MTA. 1. Student MetroCards saved (June 2010). Subways and buses move 550,000 students for free or at half-fare. For months an MTA proposal to end student MetroCards was a serious threat that roiled the public. At one point, a Facebook page set up by two high school students to fight the proposal attracted 102,000 members. This chart shows how MTA contributions to student transit have risen over the last 10 years while city contributions have stayed stagnant and state contributions decreased. I have never understood why the MTA should be expected to pay for student transit when the state and city aren’t doing their jobs. Even when the Student MetroCards were “saved” earlier this year, the solution that emerged from the compromise was not an ideal one. The state simply restored the funding that it cut for 2009. Instead of promising to fund student travel, the state is contributing $45 million, the city is contributing $45 million, and the MTA is on the hook for well over $100 million. At a time when the service cuts package totaled less than what the MTA loses to student travel, I have to wonder why we’re making concessions to what amounts to a failure of government. When the Student MetroCard program started in 1995, the MTA, city and state were to split the bill evenly with each side contributing $45 million. Unfortunately, the enabling compromise didn’t include adjustments for inflation, increased costs of providing the service or an explosion in the number of eligible. Perhaps, we should return to a scenario where the MTA contributes only $45 million as well, and if that total package of $135 million isn’t enough to provide free travel, then students will have to pay reduced-priced cards. The MTA is a transit agency, not a school bus, and the rest of us shouldn’t have to pay even more so students can ride for free.